Beets are not an easy crop to grow in our East Texas soils. We’ve experimented with many different methods of germination, we’ve directly seeded them into the field, and tried transplanting, we’ve fiddled with the fertility, and they are just darn tough. Finally in our third year of attempts at Red Moon Farm, we have a decent stand of beets. We didn’t grow quite enough for the entire CSA, but now we know we can! We’ve had a few bunches the past few weeks of the Rose City Farmers Market and want to offer you a little inspiration if you aren’t sure what to do with this great vegetable. As a girl who grew up a pitifully picky eater, I’ve come a long way. Beets threw me off at first when I begin trying them a few years ago. The more I experiment, the more I have grown to completely adore beets’ color, flavor, and their rich mineral earthiness. Boil beets in a small pan of water for 20-30 minutes, until tender. Let cool. Peel with the edge of a spoon or fork, or slip the peels off with your fingers. Cut into wedges and place into food processor. Add garlic, spices, and yogurt, and pulse to blend. Add the syrup and oil and puree until smooth. 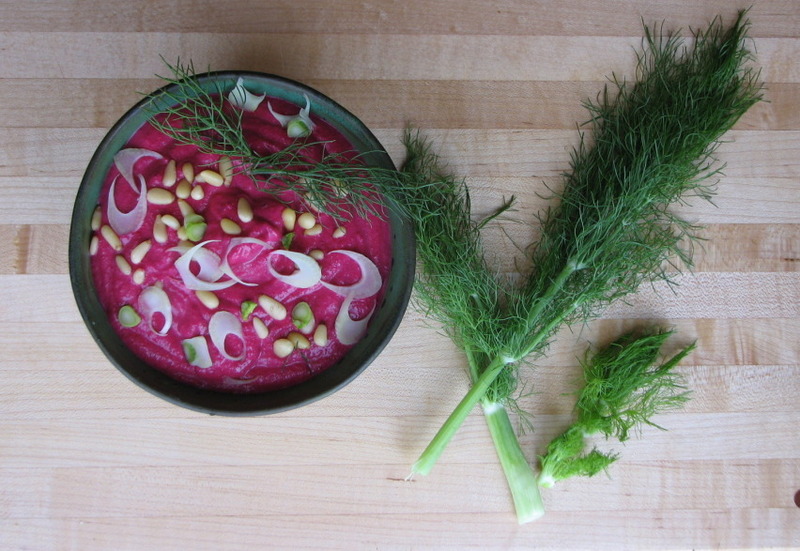 Serve in a shallow dish and scatter the top with bits of thinly sliced fennel bulb and pine nuts. 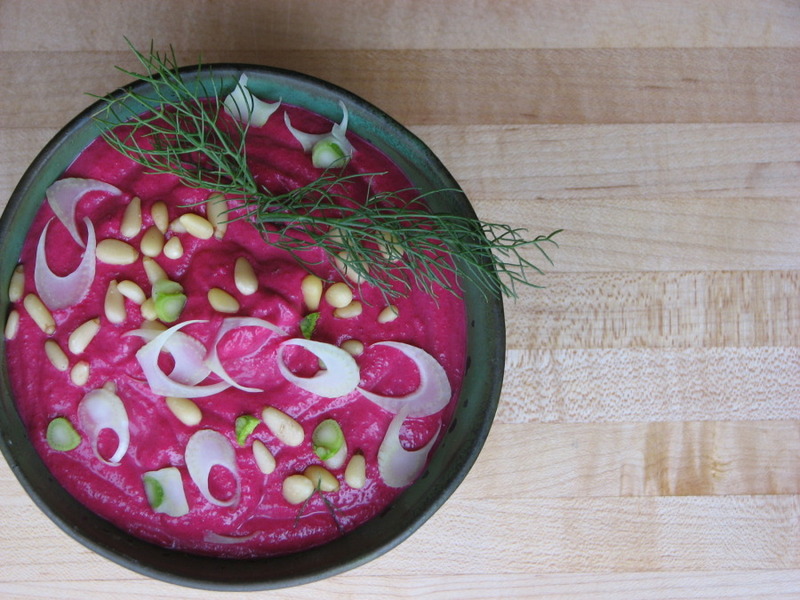 Serve with toast or pita. This sounds delish…..must try…very, very soon.